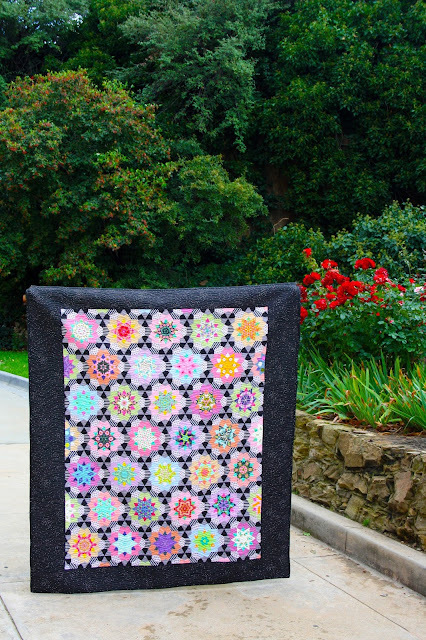 to the "Lilabelle Lane Creations" collection of quilts. 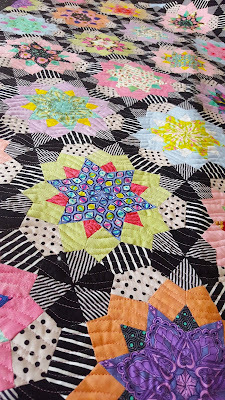 Stargazer is making its debut at the Spring Quilt Market in St Louis this weekend and can be found on the Creative Abundance Booth #740. “Stargazer” has been inspired by my many evenings spent laying in the backyard staring up at the stars and dreaming as well as the beauty of colorful fireworks high in the night’s sky. 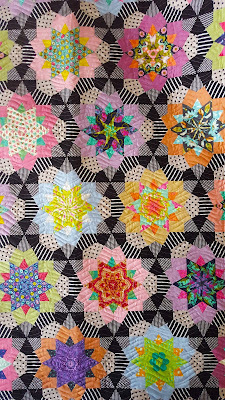 Finished Size - approx 52" x 60"
This quilt has the opportunity to be fussy cut, or not and with simple instructions on how to strip cut your fabrics you will be ready to piece in not time at all. 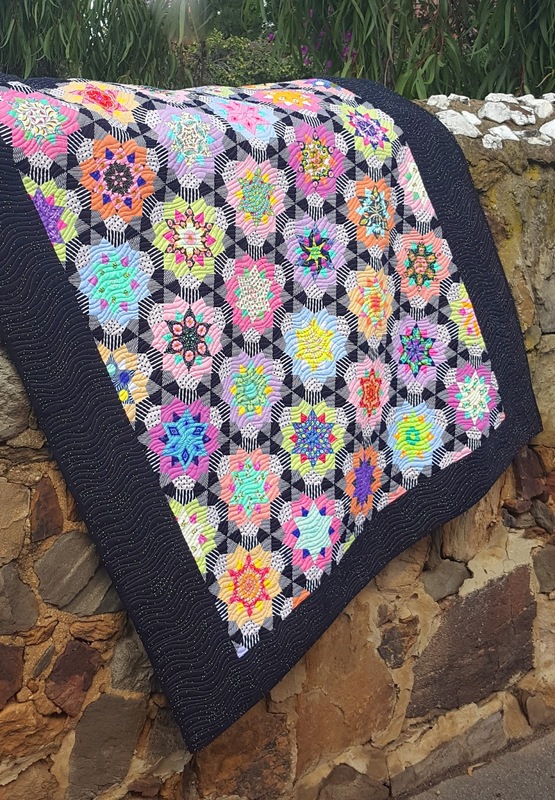 I have chosen to showcase Tula Pink fabrics in this version and have teamed them with some beautiful Japanese Chambrays from Ministry of Fabric. 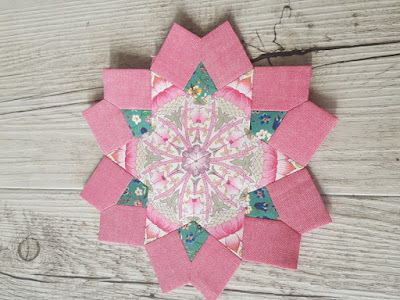 I have also started a second version but this time in Liberty fabrics from Ava and Neve and I teamed them with the same Chambrays from Ministry of Fabric but this time choosing lighter spots, stripes and even a sparkle Essex Linen. 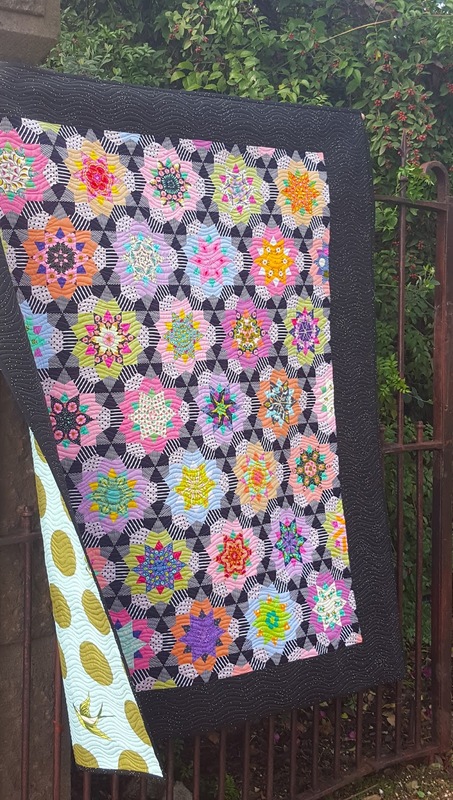 Huge thank you to Linda at Ladybug Quilting here in Bendigo for quilting Stargazer for me. I am looking forward to sharing more in this version soon. There are two purchasing options for this quilt. The Pattern and Perspex Templates or the Pattern, Perspex Templates and the Full precision cut papers pack. 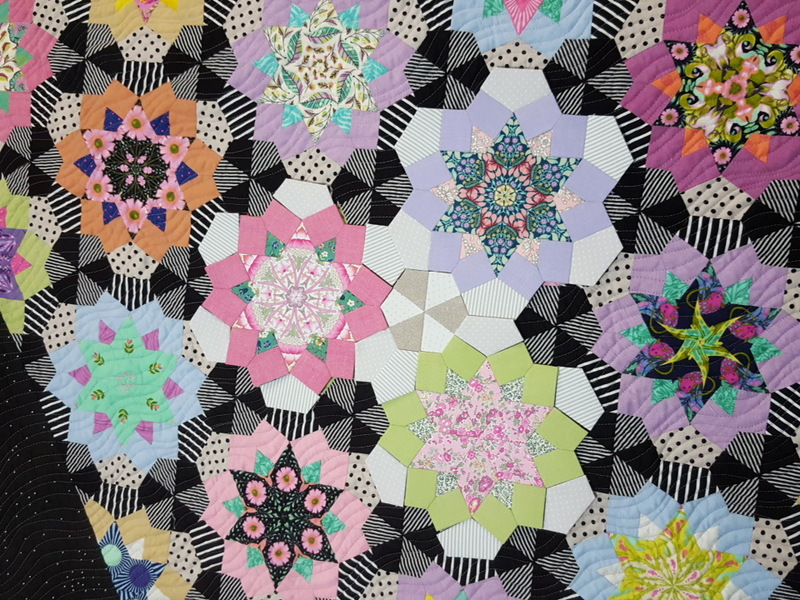 This pack includes enough papers for the entire quilt. No papers will need to be reused. Both option also include Scan N Cut friendly template pages if you like to cut your own papers. 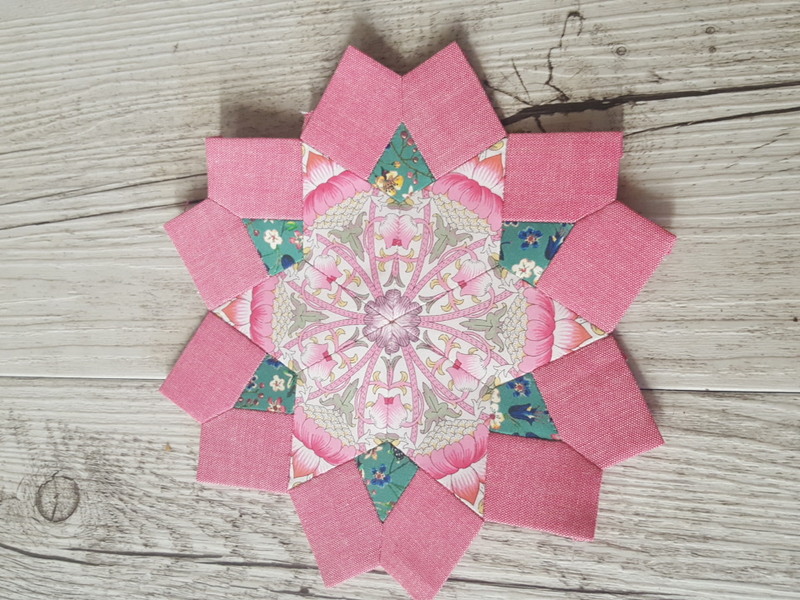 The pattern includes full instructions, beginner friendly with lots of diagrams. 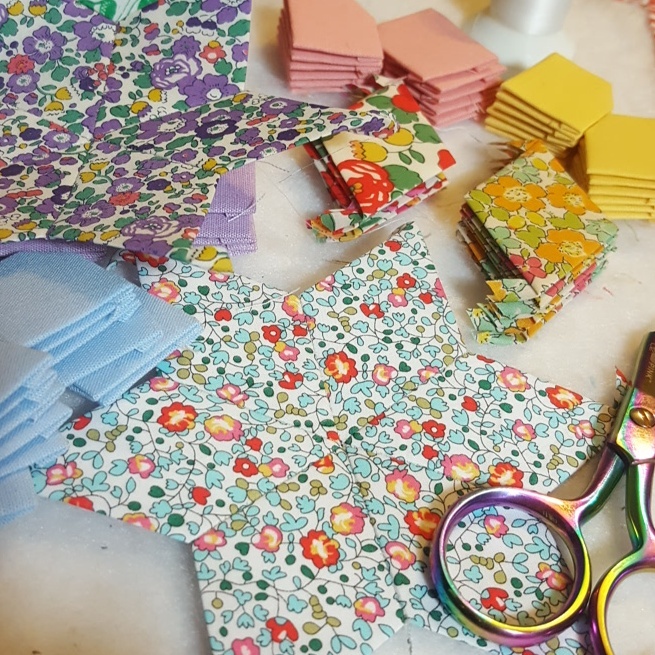 This pattern allows the maker to take the plunge into the world of Fussy Cutting, but at the same time it does not have to be fussy cut. If you would like to make your own version of Stargazer please ask for it by name at your Local Quilt Shop, Wholesale orders can be placed with Creative Abundance and I also have a few listed in my Etsy Shop HERE. If you would like to see more please visit the #stargazerquilt hashtag on Instagram. Now it is released I will be sharing more pictures and remember when making your own version to add the #stargazerquilt hashtag so I can see what you are up to.